Ahoy! 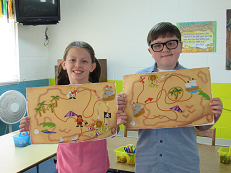 The WegoKids ministry had a blast with some of those crazy land lubbers for our pirate-themed movie day. 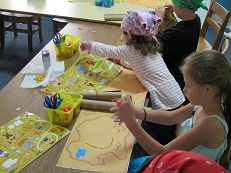 The kids were encouraged to come garbed in their pirate best and wow us with their best pirate impressions. The fun started with a showing of the VeggieTales movie “The Pirates Who Don’t Do Anything,” in which our favorite talking and singing vegetables get transported back in time to when pirates ruled the seas and must save the day against the likes of evil cheese curls, giant rock monsters, and their own fears. After the movie, the kiddos were treated to our own version of “fish and chips” and “Pirate Juice.” The fun continued with activities such as “Pirate Impressions” and “Design a Treasure Map.” It’s safe to say that everyone had a great time and we cannot wait to do something like this again. A big thanks to everyone who contributed and to the parents who send their kids each week to WegoKids, and of course to the kids themselves, who are always such a joy to work with. 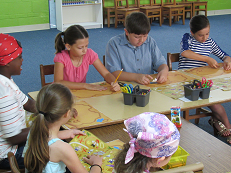 Working diligently on their treasure maps. Two of our kiddos showing off their completed maps. Our next major event for the WegoKids ministry will be our “WegoKids Day” in July. Please stay tuned for more information or contact a member of the Childrens Leadersip Team.